Nintendo has now released their first official mobile game in the form of Super Mario Run, which debuted on iOS devices on December 15. Miitomo was Nintendo’s first official ‘app’ which was released earlier this year, but I think we can all agree that wasn’t really a ‘game’ in the same vein as Pokemon GO or Super Mario Run. We also can’t count Pokemon GO since that was Niantic Inc. who developed that title. 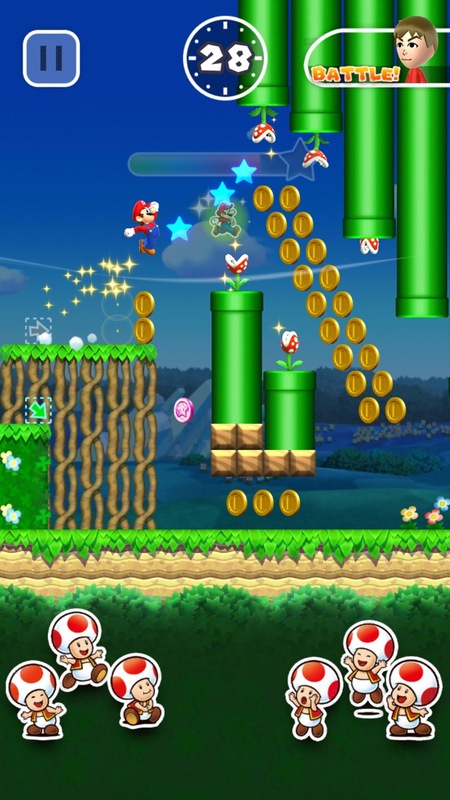 It seems very fitting that Mario should carry the torch for the first Nintendo-developed mobile title. Super Mario has been synonymous with gaming for 30+ years and has kicked off several Nintendo hardware launches through the decades. While new Mario games are always a momentous occasion for Nintendo fans, this one naturally feels a bit different. Super Mario Run is not a currently released game for Nintendo hardware that was ported to mobile and it’s not really a typical Mario game either. As I step through this review, I’ll do my best to weigh the various pros and cons of Super Mario Run objectively without comparing it too much to past Super Mario titles. 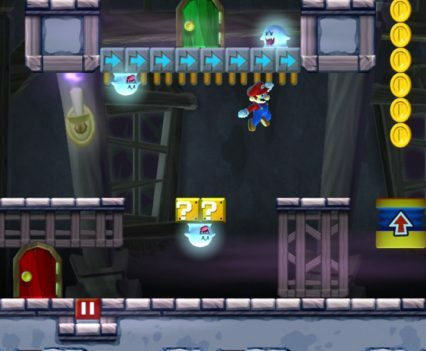 Super Mario Run is a game that is designed around the features and limitations of the hardware on which it has been released on. In that regard, it’s no different than any other Mario game. Each title has taken unique advantage of the various limitations and core features of past Nintendo hardware. Earlier Mario games were limited by the power of Nintendo consoles/handhelds and various iterations improved the visuals as time went on. 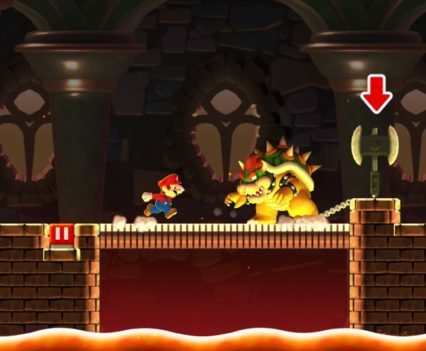 Various control tweaks have been made along the way to move Mario from 2D levels to fully 3D worlds. Mario has released on Nintendo systems that had simple button layouts, complex button layouts, and even some with motion control inputs. Now, Super Mario Run introduces players to a single input method: a touch screen. The gameplay in Super Mario Run is all about the touch screen and oddly enough it’s really the most ideal for mobile hardware. Sure, Nintendo could’ve put a digital D-pad on the touch screen and some digital ‘A’ and ‘B’ buttons, but I don’t believe that would’ve been ideal. 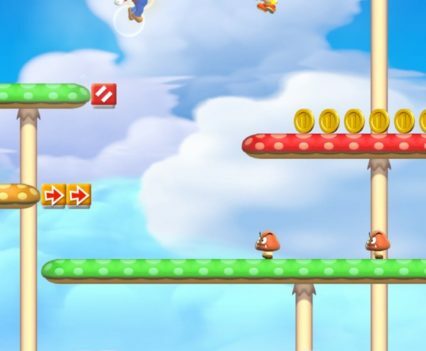 Platformers like Mario games need that precision button press and, oddly enough, the touch screen as a button works surprisingly well. 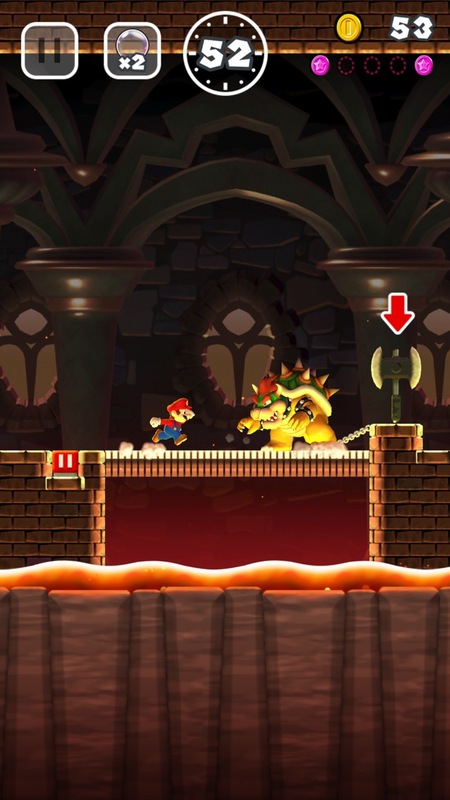 If you aren’t aware, Super Mario Run has Mario running continuously while players jump over and through various obstacles. Players need to tap the screen to jump, tap longer to jump higher/farther, tap on walls to wall jump, and tap while in the air to spin. Touch isn’t the only gameplay mechanism introduced in Super Mario Run. 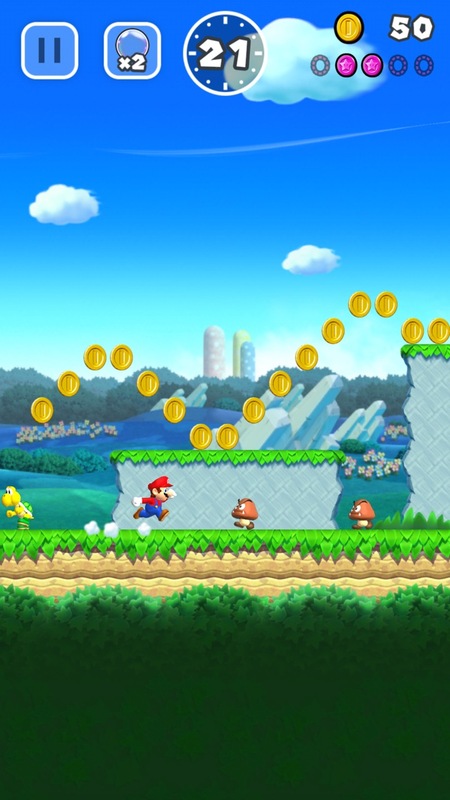 There are also ‘pause blocks’ that allow Mario to stop running at various points in the levels. 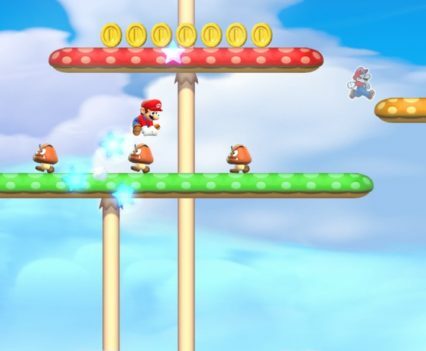 Some pause blocks are horizontal pauses—meaning if you tap after being on the block, Mario will roll off and continue running while some are diagonal pause blocks which put Mario into an immediate jump when players tap. 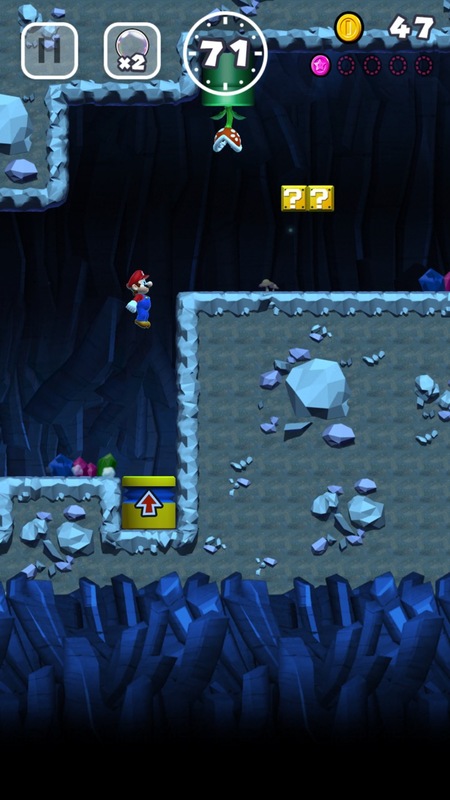 This allows the game to have more complex layouts with lava and complex enemies while also requiring the player to carefully time their trip through a level. 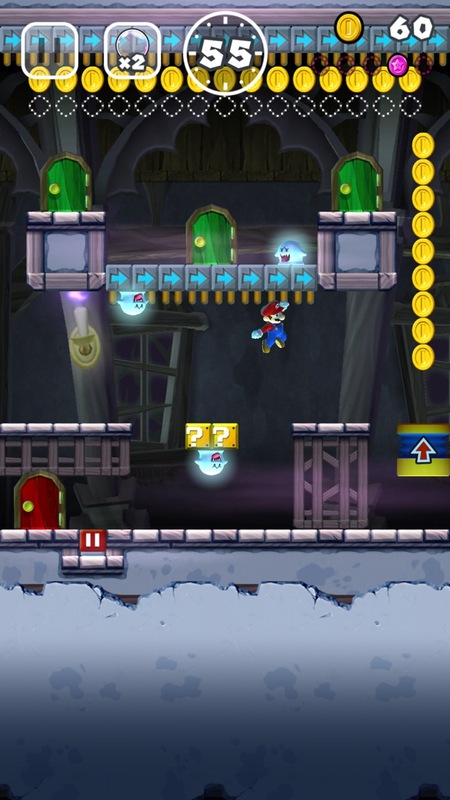 Like any good Nintendo game, the gameplay has to remain easy to pick and play and Super Mario Run excels at intuitive gameplay. Super Mario Run has 6 worlds with 4 levels in each for a total of 24 levels in the main ‘Tour’ mode. 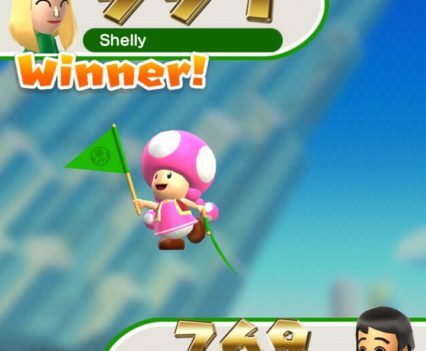 In the ‘Rally’ mode, players will have alternative levels that they can race against other players online to compete for coins and Toads. 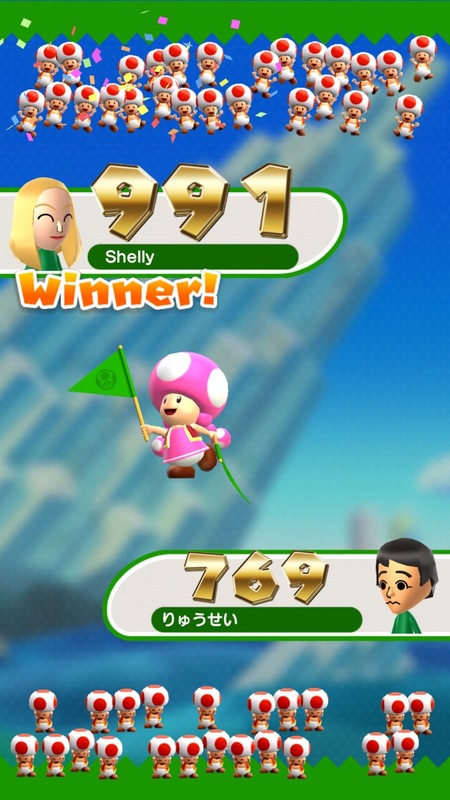 Collecting various color Toads allows players to customize a virtual Mushroom Kingdom. 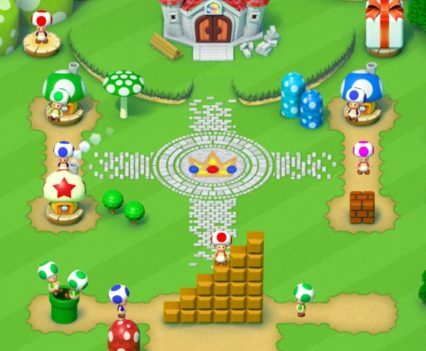 Players can place everything from tall mushroom plants, flowers, Christmas trees, Mario statues, and lots more. It’s a fun distraction and has definitely been the main draw for me coming back to the game after I completed the main ‘Tour’ mode. 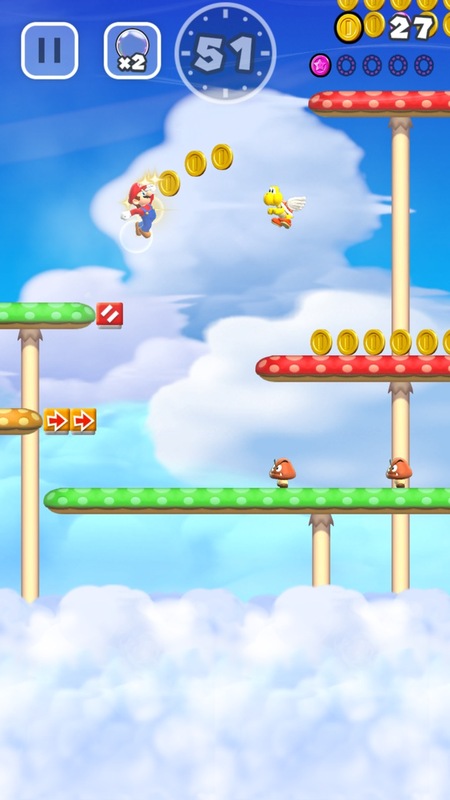 The visual presentation in Super Mario Run is what you would expect from a New Super Mario Bros. style of game. Most of the world is built with 3D-looking character models and terrain while still being a 2D platformer. 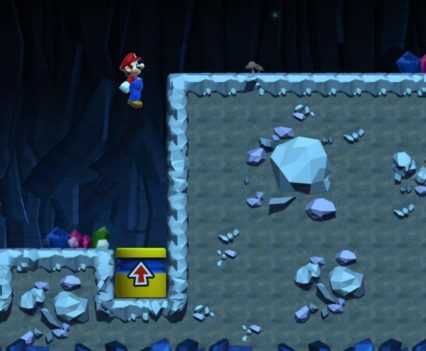 The detail in the game isn’t really that different from the Wii U game New Super Mario Bros. U. The visuals are high-definition and I never had any issues with frame rate (I was playing the game with an iPhone 7). I also tried the game on an iPad Pro and some of the textures were a little grainy if you really look close, but in most cases, the pixel density will be just fine for phones and smaller tablets. The game also doesn’t provide any advantage on tablets. 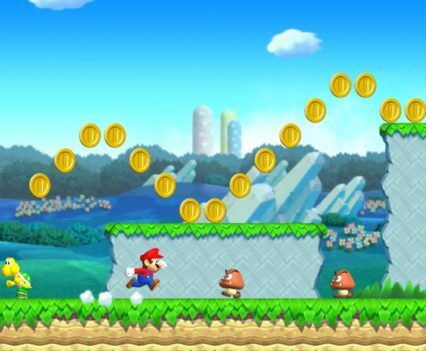 For example, you won’t see more screen area or get a better field of view when trying to collect all the coins in levels. The presentation throughout the app is top-notch as well. The user-interface is very high quality and what you would expect from a first-party Nintendo game overall. 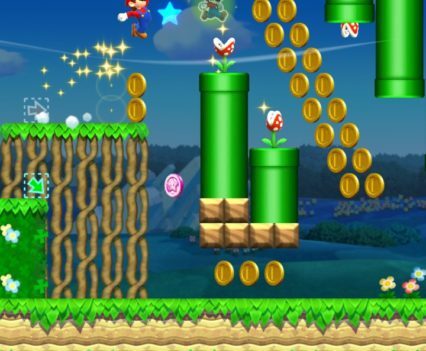 For Nintendo’s first in-house developed mobile game, Super Mario Run is a solid entry. It is designed for the hardware’s limitations and features very well. Everything about the game is polished for a ‘premium’ mobile game. One thing I know most people are a little bummed about is the price of the game: $9.99. I’m not going to necessarily defend that price because that does still seem to be a little higher than I would want to pay even for a ‘premium’ mobile game. I know that can sound harsh to any game developer out there especially for those that put a lot of hard work into their game’s visuals/gameplay. I’m just saying the market, for better or worse, has been balking at the price and I can’t necessarily blame it. Nintendo’s a little ‘darned if they do, darned if they don’t’ unfortunately. If they had released the game as a paid app for $9.99, it wouldn’t be downloaded nearly as much. You almost have to release a ‘free’ or ‘freemium’ type of game in this day and age on mobile app stores. Nintendo could’ve also released a ‘Super Mario Run Lite’ and had the main game as a separate app, but even that gets messy. In the end, I honestly think Nintendo made the right choice to have the game be ‘free to start’ with one in-app purchase of $9.99. 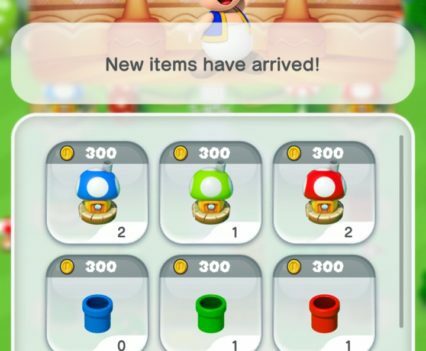 The $9.99 may be a bitter pill for most people to swallow, but in Nintendo’s defense, it’s a 1-time in-app purchase instead of having 100’s of $0.99 in-app purchase content. 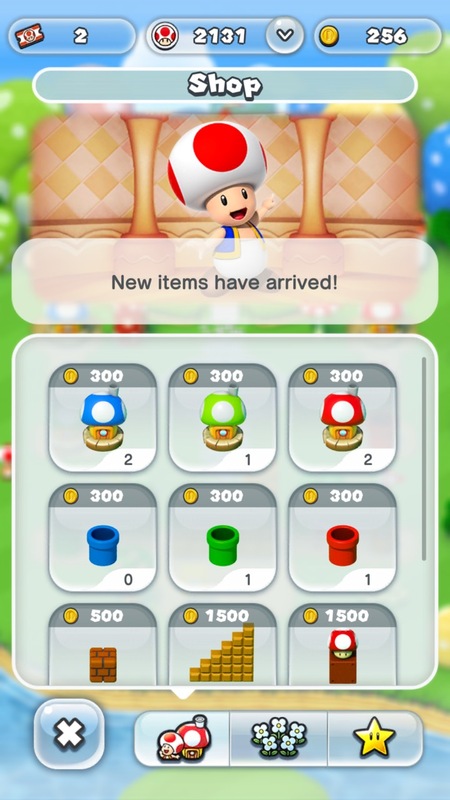 All the items players can customize their virtual Mushroom Kingdom can be paid with in-game coins for example—can you imagine if those were tied to in-app purchases? No thanks. In summary, if you are looking for an amazingly fun, free-running platformer to play on the go, Super Mario Run is top-notch. My only gripe with the game is that I wanted more levels for the ‘Tour’ mode and longer levels. 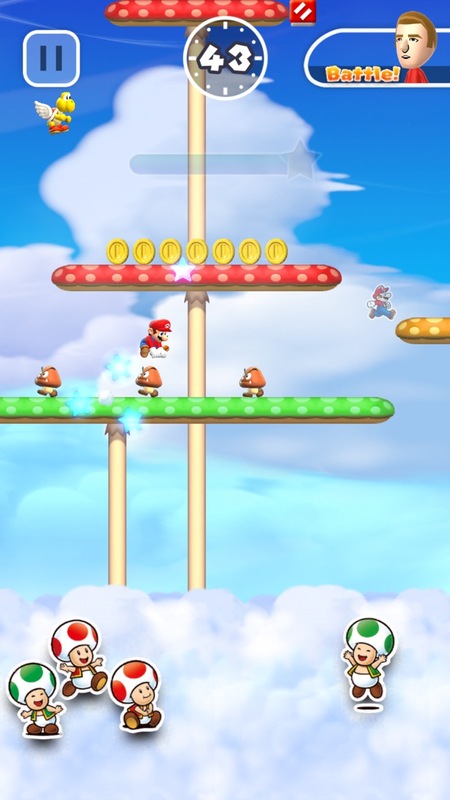 It’s not a purely unique idea for mobile devices, but Super Mario Run’s gameplay variety mixed with the added replayability of the Toad Rally mode and the virtual Mushroom Kingdom builder, will provide hours and hours of entertainment. 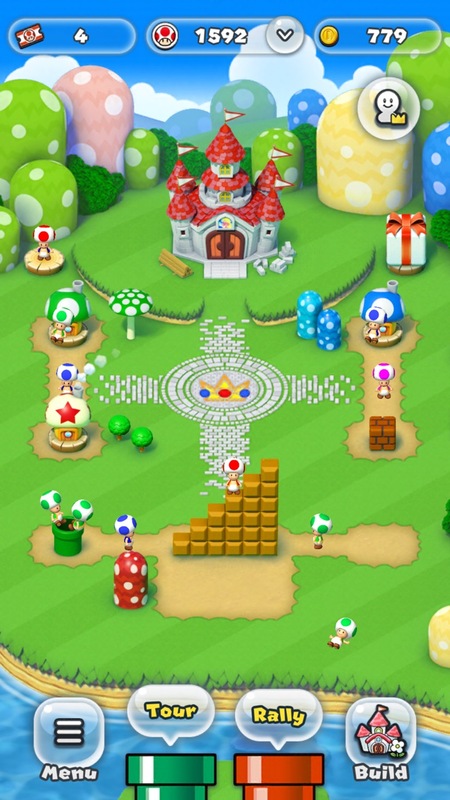 It’s not a purely unique idea for mobile devices, but Super Mario Run’s gameplay variety mixed with the added replayability of the Toad Rally mode and the virtual Mushroom Kingdom builder, will provide hours and hours of entertainment.